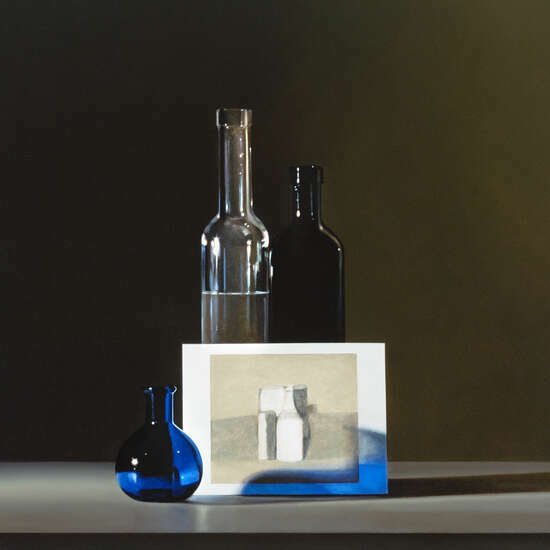 Guy Diehl’s carefully composed still-life images take the viewer on a fascinating journey through important stages in the history of art. 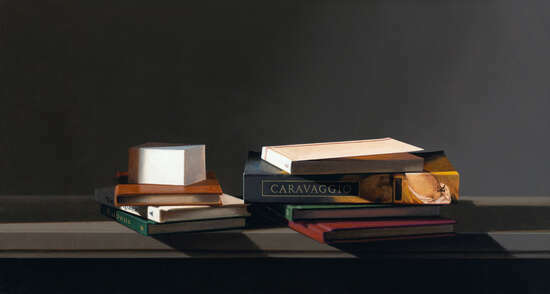 His new paintings appear under the title “Book Series”. 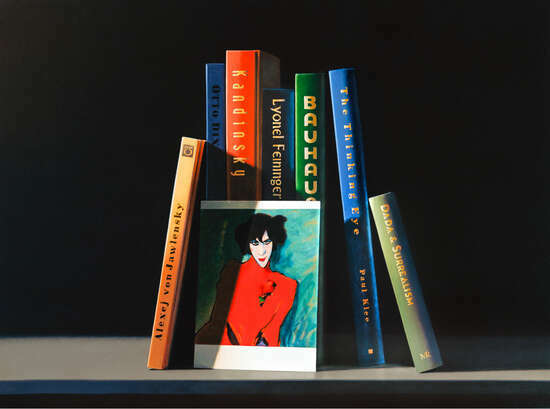 In addition to the traditional objects – vases and postcards containing images from works of different artists, with which he plays in each picture – books now feature prominently: Books about the artists, their influences, and the historical contexts in which they worked. 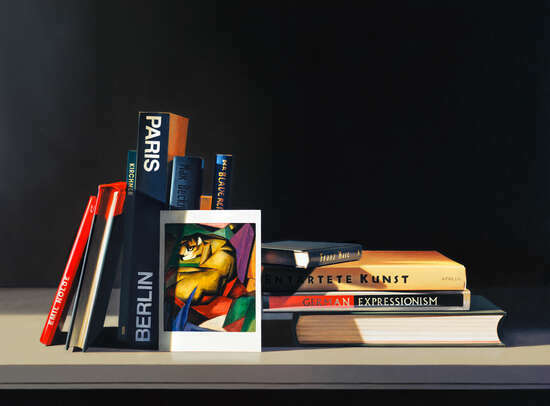 Guy Diehl himself does not stay in modernity, instead wandering along with Caravaggio and Edward Hopper through different eras of the past and present, setting free the colours and styles of different centuries. 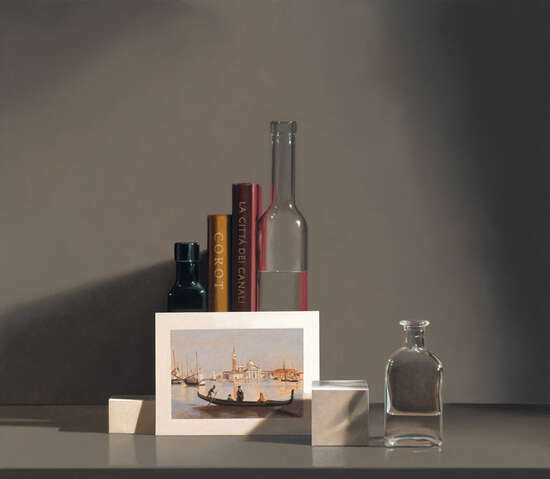 The dark-toned still lifes by American artist Guy Diehl are renowned, original works of the purest shade. 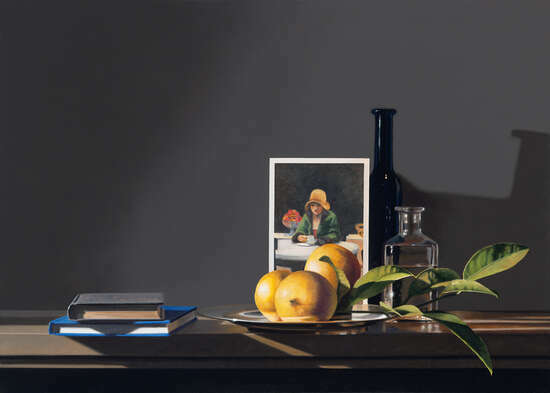 A clear, fresh light rules like a glowing furnace over carefully arranged objects representing art history and time. In the pictures, the border between painting and photography dissolves perfectly. 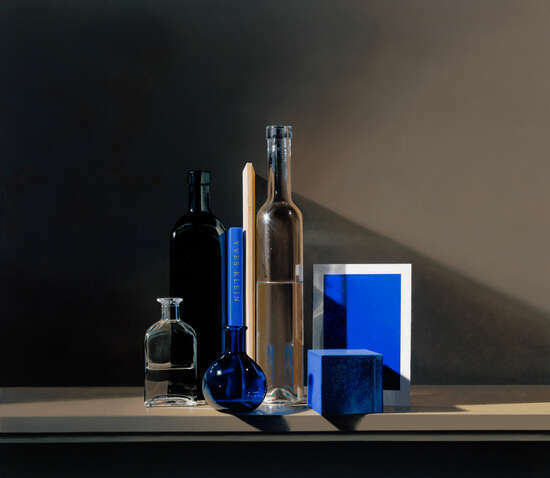 The application of color, drawing of details, and direction of light generate an overwhelming effect of photorealism; the final appearance is astonishing. 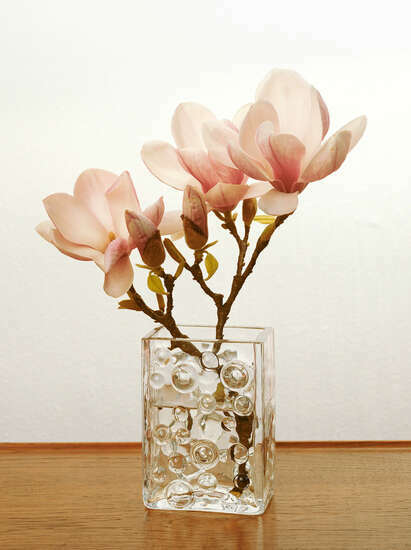 A three dimensional, deep space opens before a neutral background: everything strives to fit into the historically loaded and symbolically meaningful family photo album. 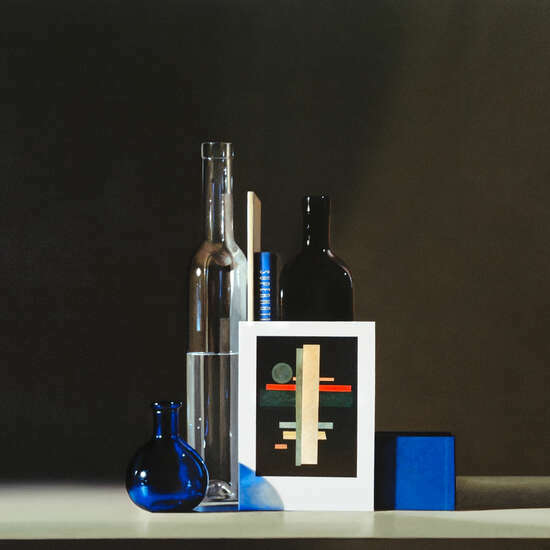 A new, well-known modern artist reigns in each picture. 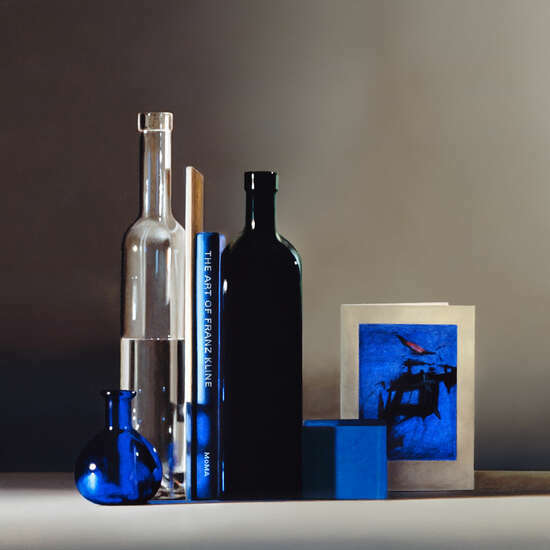 Yves Klein or Amedeo Modigliani are represented, for example, in the form of their respective, very famous art books, a sought out motif, and intentionally placed objects such as bottles, glasses, or other color coordinations. 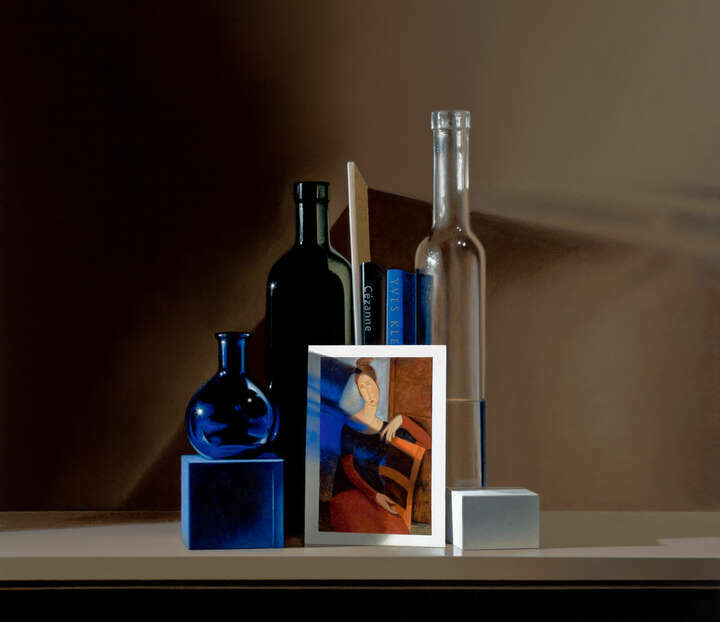 By grasping the typical style of each artist and meaningfully combining it with classical forms of still lifes, Guy Diehl mixes tradition and modernity. He invites you to a school of conscious viewing. Although invested to the maximum with an objective multiplicity of meanings, the works nevertheless prove to have captured the ideal of aesthetic reduction. 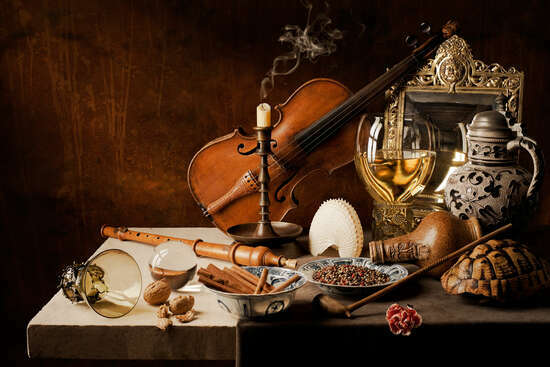 Each piece of a painting appears clear and without embellishment: neither less realistic nor more artistic. 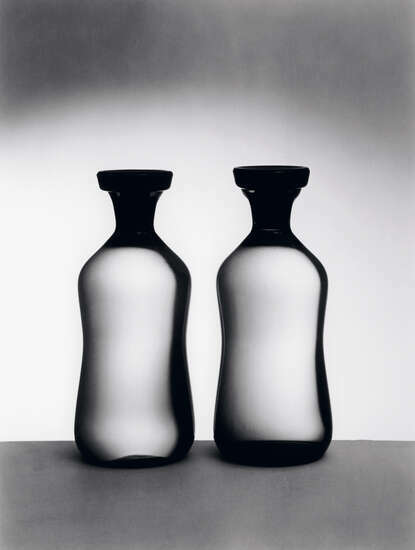 Guy Diehl doesn’t need to paint the film of dust to give his pictures more depth or to trace living time. Utter creative permeation, in the form of transparency and opaqueness, effective highlights and secret shadows, takes the viewer on a hypnotic journey through a sought out chapter of art history and modernism. These pictures are truly sensual plays of historic, lively materiality before the background of a thoroughly modern, picturesque accuracy.